Proponents of intelligent design thought they had this small, yet vastly important, query under their control, or in the bag if you will. The flight of bees, that is. In the mid-1930s, French entomologist August Magnan came to the strikingly weird, yet seemingly true observation, that bees’ flight was aerodynamically impossible. 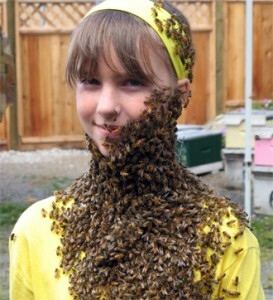 However, most humans have witnessed at least one girl leap out of their seat at the sight of a flying bee. So how can this statement be true? How can bees’ flight be theoretically impossible and still practically possible? Michael Dickinson, a professor of biology at the University of Washington and a noted bee enthusiast, has found the answer. Using an incredibly sensitive camera, he and his team filmed hovering bees and captured their movements at 6000 frames per second. They discovered that the honeybee, which they used as their test subject, makes a 90 degree arc in the upstroke and then comes down, only to flip their wings completely upside down at the end of their downstroke. 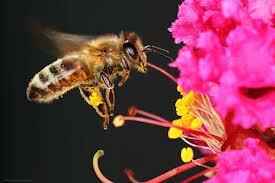 This allows the bee to push the resultant air downwards during both the upstroke and the downstroke! This, in turn, generates twice the amount of lift which the creature would usually get. 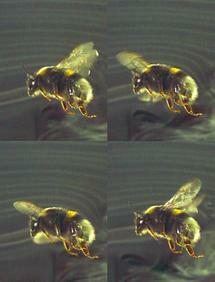 However, this evidence is still sketchy in explaining how a bee flies with such short stubby wings. Also, for comparison sake, the fruit fly is one-eightieth the size of a honey bee and flaps it’s wings about 200 times a second; the honey bee flaps it’s small skinny wings a amazing 230 times a second! This was remarkably confusing to scientists who know that as a creature gets smaller it’s aerodynamic efficiency decreases and so it must flap it’s wings faster to make up for that. When accounting for lower air pressure or extra weight, the bees increase their wing stroke amplitude but do not adjust the frequency of their wingbeat. When watching the bees fly in super-slow motion it is clear that they possess special and exotic forces which not many other creatures do. Firstly, they create the same sort of vortexes which bats and other heavy, high-speed flyers do. The essential mini hurricanes have extremely low pressure in the center, as compared to the surrounding air and these vortexes move around the wings and produce extra lift for the honeybee. But not even these peculiar flight dynamics are enough to satisfy the bees, or for that case, enough to keep them aloft. By flipping the wing upside down and moving in an arc, the wing flaps back in its own wake, which produce higher forces than flapping in still air. Another force, labeled Added-Mass Force, is still mysterious and it is only known that it is related to acceleration as the wings’ direction changes. So no longer are scientist completely baffled by the idea of bees’ flight. They have made remarkable advances in the last ten years and provided more proof for science against intelligent design. Engineers are now looking into designing robot vehicles which mimic the way that bees fly and how they produce an amazing amount of extra lift. These could potentially be used for disaster surveillance after earthquakes and tsunamis with their ability to hover in place.